Kovex-Computer Kft. 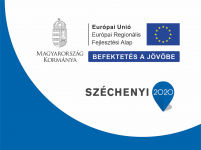 has secured a grant of 11.44 million HUF on the tender titled „Versenyképes IKT szektor fejlesztése”, jointly financed by the Hungarian dovernment and the European Union. The total budget of the project is 15.26 million HUF. The aim of the project is providing assistance for the beneficiary in participating Horizon 2020 applications and general R&D endeavors. During the project external advisors performed the monitoring, evaluation, preparation and marketing activities from a H2020 perspective. The planned project helps to place compolsury standards into ontologies in order to assist a wider usage of said standards. Name of beneficiary: Kovex-Computer Kft. Amount of subsidy: 11.446.500 Ft.